A full line of innovative guitar stands and accessories! 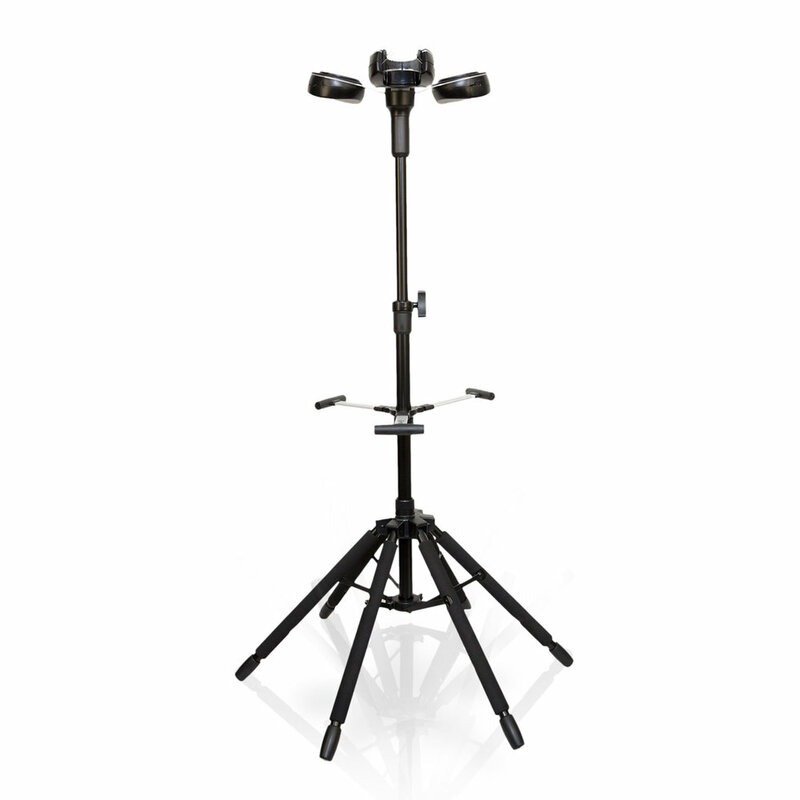 Hydra is our flagship instrument stand that will make a world of difference for your life on the stage, in the studio and in the rehearsal space. It is our BEST IN CLASS triple lifesaver for your guitars, basses or other stringed instruments. Hydra is the only 6-legged triple-instrument floor stand with a gravity-activated locking system on the face of the planet, effectively making it the world’s safest place for your instruments to be. Now you can bring your top 3 instruments to every gig, knowing they will be 100% safe while waiting to be picked up and take center stage. Standing twice as stable, there is virtually no way you’ll accidentally kick, bump or push down your instrument. Standard guitar stands tilt at 15 degrees – not very safe. Fresh out of Safety College, Hydra was designed to withstand a 30+ degree tilt, making it twice as stable and 100% more secure. Insert. Let go to activate the safety gate. And your instrument is safe. Hydra folds down to half the size in seconds, allowing security to be convenient as well as compact. You shouldn’t have to choose between safety for your instrument and the ability to travel compactly and with confidence. Hydra features TPE Polymer (Thermal Plastic Elastomer) over alloy steel to cover every point of contact with your instrument, making sure the finish is 100% unharmed. No way your instrument ends up broken on the floor with our Grip Friction System. We have confidence in our products. So, we have your back. For good! *See details on D&A Guitar Gear Lifetime Guarantee. ©2018 D&A Guitar Gear. All Rights Reserved.